When it comes to satisfying halal dim sum cravings, it's not surprising when people recommend this place. 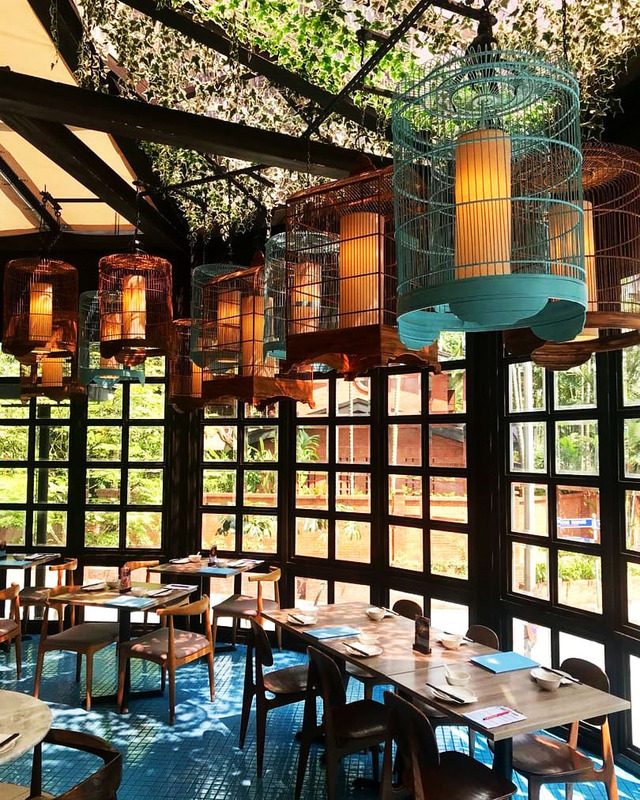 It has quality food that are not just limited to Dim Sums as well as an interior that is instagrammable at every angle. If you've been to Kuala Lumpur, you probably would've heard of or dined at this place. If you haven't... then you should. Dolly Dim Sum isn't something unfamiliar to locals or frequent visitors of Kuala Lumpur. It has been around for quite some time and they have quite a number of outlets in the city but the one that Fazwan and I visited was the one at Avenue K Mall (right opposite the KLCC Twin Towers). I have seen the one at Pavillion and Sunway Putra, but I personally think that this outlet is the prettiest out of all the other outlets. The former is merely just a place to dine but this one, was aesthetically pleasing to a whole new level. Fazwan and I dropped by at around noon on a weekend and the place was already starting to flood with patrons. We decided to come pretty early because many of the Google reviews online mentioned about having to queue for hours on the weekends, before being given a seat. My Malaysian friends have warned me beforehand that this was an overpriced and overrated place to dine at but we thought we'd give it a try, since we both had never dined here before. You will need to wait to be seated, where a staff will then provide you with an order sheet on a mini clip board and the menu. If I remember it correctly, the menu didn't have prices listed down but the order sheet does - which means that you will only know the prices of each dish when you're seated - which I assume would entice one into ordering because by then you would be too "paiseh" to stand up and leave? Hahaha. I know I would be embarrassed. Chilled drinks to beat the Malaysian heat. Siew Mai Dumplings // We tend to rate a Dim Sum place by their siew mai. Heh. Thai Style Fried Rice // Fazwan's staple but it was too spicy for me. Dolly Moza Roll // One of my favourites here! There's prawn and oooozes of mozarella inside. Dolly's Fried Chicken Wings // You can't go wrong with thickly battered fried chicken. Chewy Meat Croquette // From the outside they look like sambal buns. Chewy Meat Croquette // I personally liked the chewy texture but the portion of the filling was very very very disappointing. Roasted BBQ Buns // The inside of those buns, filled with honey chicken! Super savoury, I loved it. Egg Custard Bun // Kinda like the Golden Sand Bun we're used to having in Singapore, but thicker. The aesthetics of the place, obviously. Quality of food was pretty great. The availability of staff was scarce (probably due to lack of manpower) but service was considerably good, even though the food took awhile to be served, the service standards made up for it. I have to admit, the price is set on the higher end of the bar - we spent around SGD30 per pax for this meal. This is not something most people would enjoy - especially when there's Tapak Urban Street Dining just two minutes away for just 10% of the price. The place also shares the dining space with Fresca - a Mexican restaurant & bar. We didn't mind because Dolly's halal certified but I thought I'd just mention it here, in case it matters to you. I am not going to compare to any other Dim Sum places because I don't think it's fair for any business if people start comparing - we may never know who their target audience or business plan is. Overall, we really loved the ambience and aesthetics of the whole place but all in all, I honestly think that the price isn't worth the hype.